To make sure that the garment fits, you should know your size. You can easily determine your size from various individual measurement guidelines. Please take into account that different measurements will only be valid depending on the country. The following information will help you to determine the adequate size. In case of double sizes choose the larger one. Measure around the fullest part of the chest horizontally. Measure horizontally around the fullest part of your hip or buttocks. Especially regarding swim wear, there are different indications of size. Our chart is to be used as a small guide for your order. 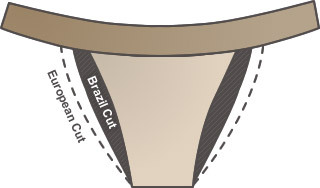 The Brazilian Cut is the narrower and smaller version of seductive bikinis. Altogether, the cut is smaller at the front as well as the back, which has a positive effect on the wearer’s figure and gives a perfect, seductive look. The subtle curves are perfectly emphasized and cast a positive light on the figure. The European Cut is a bit more ample and so that it is suitable for every figure. The ample cut gives the bikini a perfect fit as well as a high wearing comfort. Furthermore, it always looks chic and elegant.